Another weekend, another race. I can hardly keep up with my own schedule! This past weekend was the Liberty Classic in Philadelphia. 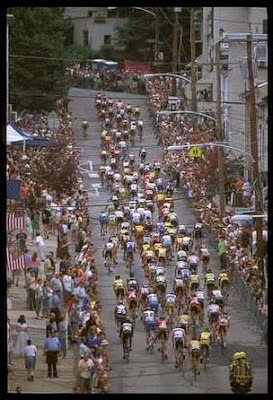 The Liberty classic is a very famous one-day UCI sanctioned race that has been running now for 19 years. An interesting fact is that an American had never won the race since it began... and that tradition continues. The course follows a circuit right through central Philadelphia and makes its way up the famed Manayunk Wall. 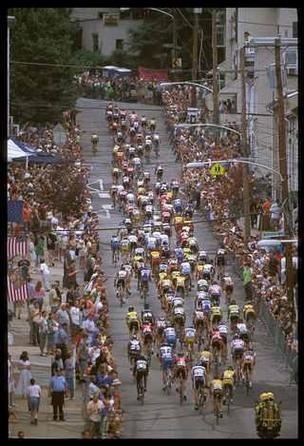 The picture I had in my mind after speaking with many cyclists was that this was one heck of a climb. Maxing out at 17%, this climb would make your legs scream for mercy. This google image gives you a good perspective, I would also like to point out that it continues once you turn left. My legs did scream for mercy each of the four times up this climb in the race, but I was still relieved it wasn't the literal wall pictured in my mind. It is also amazing what thousands of screaming fans can do for motivation! Even with this slight obstacle on course to make it hard and whittle down the race, most big teams had their sprinters and wanted to keep the race together for a bunch sprint. We set up a nearly successful lead out coming into the finish. A slight error led to 4th place for me and 5th for Joelle. Close but not quite. Ina was the victor in the end, still no American winner for this American event. This weekend I will return to race as defending champ for the Airforce Cycling Classic in Arlington, Virginia! I'm super excited to meet up with team-mates again and to race some crits. Leah......congratulations on being selected in the Olympic Pool......Now go get SelecTed......Good LucK....!